Mini Grow Polytunnels are ideal because they can be transported around easily should you need to relocate it. They are cost-effective and help to protect your crops from the weather and pests. 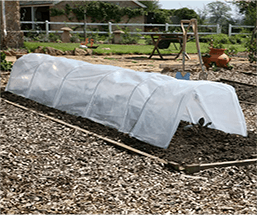 Alternitively, Polytunnels are useful for warming the soil prior to sowing/planting.